FINAL FANTASY II is highly anticipated follow-up to the original FINAL FANTASY, released in Japan in 1988. The game features the bitter and beautiful tale of four war-orphaned heroes who become embroiled in a conflict between the hostile Empire of Palamecia and the rebel resistance. By eschewing conventional leveling for a proficiency system that allows players to tailor their characters’ growth and incorporating a key term memory system that makes dialogue integral to gameplay, this game sparked the spirit of innovation for which the series has become known. This release also contains the bonus dungeons added to later editions of the game–the Soul of Rebirth and the Arcane Labyrinth. This game is what you’d call…a chore. 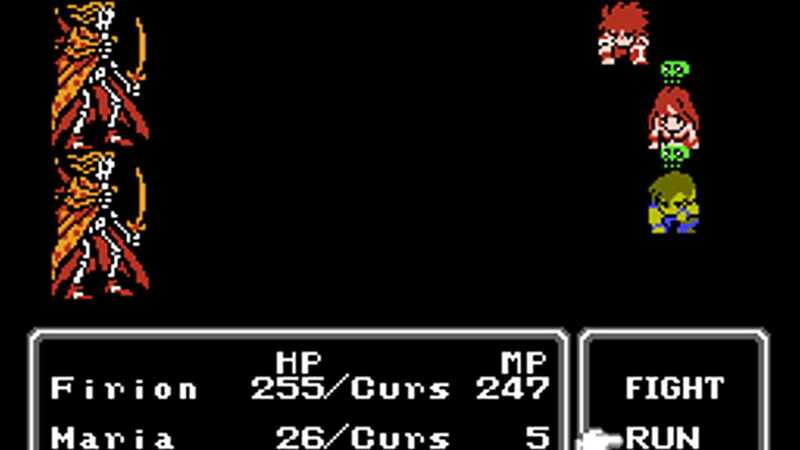 The game works off the design of FF1 by creating stat specific leveling, this makes the idea of leveling feel a more random, pairing that with the idea of experience capping (the idea of reducing experience from enemies as you become stronger), and the design choice of leveling magic up specifically by use means that every element of the gameplay seems to hinder every other element of gameplay. The game punishes you for grinding specific stats, but also punishes you for trying to level up worse stats because they are less efficient. This either means that every character becomes the same grey blob of skills, or start to become utterly useless during the late game. The story is serviceable. The world is at war with the empire, who are creating an ultimate warship to destroy cities, the emperor keeps the world at bay with his sizeable army, and his dark knight. The game heavily takes star wars as it’s inspiration but keeps it unique enough to make it interesting. The game has some really memorable audio, and there wasn’t really any downsides, I particularly liked the Boss Battle themes. Overall, I can’t recommend the game to any but the die hard fans, and even if you do, the grind of this game isn’t worth the effort, therefore I recommend the GBA or PSP version which seem to be a lot easier in that sense. Copyright © 2014 - 2019 SocksCap64, All Rights Reserved. Logos, Trademarks, Pictures Belongs To Their Respected Owners. Powered By WordPress. 108 Queries in 0.647 seconds.